I've never much liked David Bowie, but I loved the scenes with all the TV monitors in The Man Who Fell To Earth. For someone growing up in a land of three TV channels, it was a splendid vision of informational abundance. Imagine all those channels; you'd never, ever get bored. (That didn't quite work out as planned did it?) 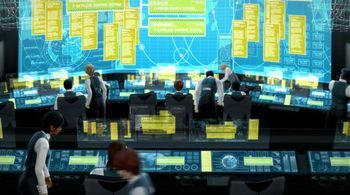 And I've loved that wall of monitors / control room feel ever since. The TV room at Graceland, Cy Ogle's sphere of monitors in Interface, this lovely control room in Appleseed Ex Machina, or the one at Fermilab, or at Cyworld. Or the genius of LiveNewsCameras. Maybe that's why the surveillance/CCTV idea is still so pervasive. People like the idea of control rooms. Anyway, I've started with a tangent. 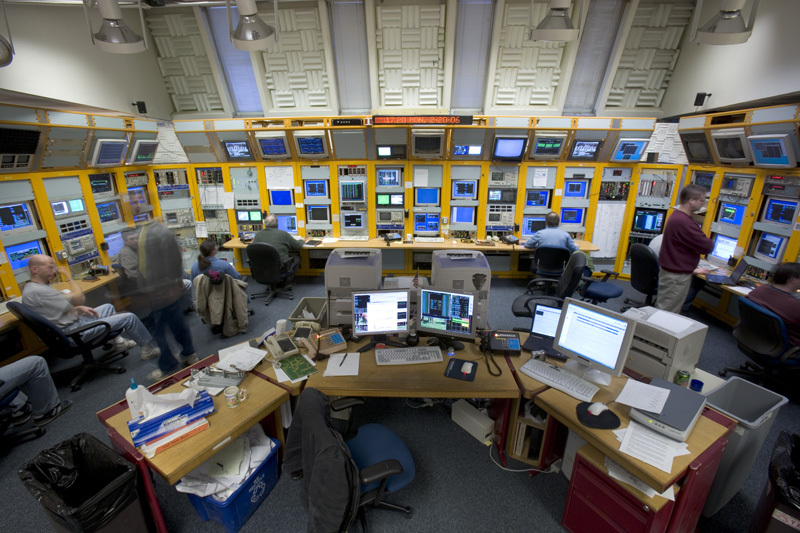 I didn't really mean to be writing about control rooms. I wanted to write about making glance-able web stuff, specifically a full-screen twitter. If I'm working at home I normally have laptop on my lap, feet on drum stool and a samsung monitor on the table connected to a mac mini showing some combination of itunes, twitterific or the telly. (None of this focus stuff for me, I like to be distracted). And, the screensaver is that RSS twitter combo described by Iain. I like twitter sitting in that bit of my attention, in the corner of the room, glanceable, but not pinging at me like twitterific or twhirl do on my desktop. I want it to be a fullscreen ambient thing, not a peering closely thing. And the Apple RSS screensaver is too slow to update, and too small and swirly to read across the room. So, I'm wondering if there's a fullscreen twitter application. Something as big, legible and self-starting as twistori. Something I can configure for my friend stream, big type you can read from across the room, nice and clean, no need to be able to write twitters into it. I'm not alone in wanting this but I can't seem to find anything that quite does it. I'm probably being stupid, I'm sure I've read about this sort of thing being done at conferences. Does anyone know of such a thing? Actually, I suspect we might be entering a phase where it makes sense to build internet things you watch rather than do, things for the other monitor, things that replace the TV you're not really paying attention to with a spare monitor you're not really paying attention to. Like Chumby widgets. Or Poke NYC's upl8.tv. There are lots of little apps that will pop something in the corner of my screen, or scroll it along the bottom but I don't want that level of distraction. I have to filter that cognitively. I want something that pops up in large-type on another screen, across the room, something I can filter physically, by not looking at it. Things in the corner of my screen are only pretending to be peripheral, they're still too close. I want my distractions further away, but bigger. Actually, that's not a bad brief for the internet in general is it? - make it further away, but bigger. I don't know what I'm saying now. I'll stop. I'd have thought that the Apple screensaver is probably Quartz Composer-based (that's how I'd have written it) so it might be quite easy to fiddle with, i.e. make bigger and less swirly. Yeah, looks like it is, so I'd guess even if you have to take it apart and put it back together again it wouldn't take long to make a big full-screen legible scrolly RSS feed from it. You can get a feed of your Twitter friends via RSS can't you? There's got to be an RSS screen saver out there. If not it's gotta be dead easy for someone (else) to build. In Safari click on the RSS tab at the bottom of your Twitter page. Add that feed to your Safari bookmarks. Move that bookmark to the Safari RSS bookmarks. System Preferences, Screen Savers, RSS... I'll show you. Ben, you've not read the post properly have you? Matt, that would be lovely, if you ever have a moment. i'd love to see a twitter stream in an LED newstream type thing - like a mash-up of a jenny holzer piece and the NASDAQ. You might be able to use Fluid (fluidapp.com) to create a fullscreen TwitterBrowser of your own. If you want to cut to the chase, download the linked BigFatTweets.qtz composition from near the end of that blog entry, stick it in your Screen Savers folder as instructed, and throw it at your Twitter home page feed.